The board considered two sets of amendments to town ordinances. The first, which impacts mineral extraction operations, such as quarries, was tabled until the board’s next meeting. The second, about development in certain watersheds, was sent back to the Town Council with comments. The first group of amendments was developed by the Mineral Extraction Committee, which was charged by the council with reviewing the town’s zoning map with regards to mineral extraction and making recommendations about changes to the map or regulations. These amendments “brought the town’s ordinance more in compliance with state standards,” according to Town Planner Amanda Lessard. They are more restrictive “in regards to some standards related to setbacks, road standards, hours of operation and dust control,” she said. During the public hearings, many Windham residents, as well as some from abutting towns, spoke about mineral extraction operations. Michael Manning urged the Planning Board to be responsible and consider the impacts of mineral extraction operations. “Be strong, be the responsible adults in the room. Would you want this in your backyard? Would you want this feeding your well water? Would you want this decreasing your property value?” he said. Kevin Clark said he would like the board to focus on preserving the town’s natural resources, notifying abutting towns of potential mineral extraction operations and protecting aquifers. Twenty-three residents spoke at a Mineral Extraction Committee public forum Sept. 20, and all seemed to have concerns about mineral extraction operations. 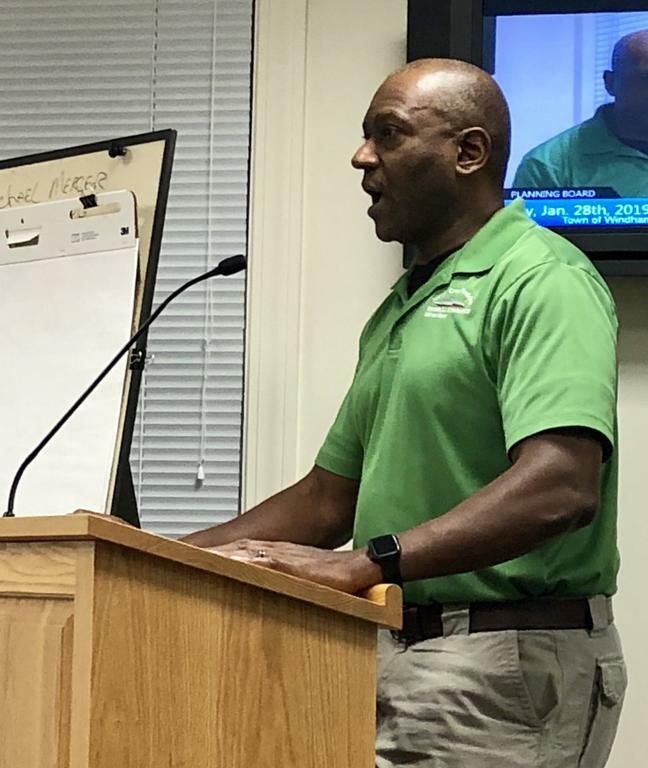 After discussion Monday night, Planning Board Chairman David Douglass said he wasn’t prepared to make any recommendation to the council at that point. “I can’t tell what all the unintended consequences are here. As a Planning Board member, I don’t know how to recommend this yet,” he explained. Other members agreed, and the board voted 6-1 to table the discussion until the next meeting, with Andrew Mayo against. The second group of amendments came from the Highland Lake Leadership Team, Lessard said. They require that “a qualified independent professional review an application for a project located in the watershed of a lake most at risk from new development to ensure compliance with the site plan or subdivision performance standards for stormwater management, erosion control, sewage disposal, groundwater protection and water quality protection,” according to a memo from Lessard to the Planning Board. Those lakes include Chaffin Pond, Forest Lake, Highland Lake, Little Duck Pond, Little Sebago Lake, Pettingill Pond and Sebago Lake. Douglass felt that it was unfair to put such additional provisions on developers when the quality of the lakes has been deteriorating far before they arrived. He was concerned about residents contaminating the lakes and proposed that they be put on a “level playing field” with developers. “Catching omissions is really the main objective,” Lessard said. Bill Walker proposed sending the amendments back to the council with edits, including that they be instituted for a period of four years while they are reviewed and that data be collected on the value and effectiveness of the review process. The board voted 4-3 to send the amendments to the council, with Mayo, Elder and Douglass against. The town is currently in the midst of a lawsuit, filed by Elvin Copp and his son Randy Copp, over the town’s mineral extraction moratorium. The Copps, of CSG Properties and Copp Equipment, filed a lawsuit against the town in May after the Town Council passed a 180-day mineral extraction moratorium in April. The moratorium has been extended and is still in effect. The moratorium came after Randy Copp presented a sketch plan to the Planning Board March 26 for a 106-acre quarry off Lakeside Drive in the Forest Lake area. Residents at that meeting raised concerns about the project’s impact on quality of life, noise, traffic, safety and air and water quality, among other issues. Michael Manning addressed the planning board Monday night. Kevin Clark suggested the board focus on notifying abutting towns of mineral extraction operations. Many residents turned out to speak about the proposed ordinances.